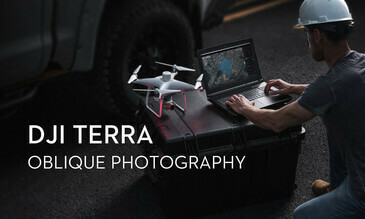 1.How do I purchase DJI Terra? DJI Terra Advanced and Pro can be purchased through authorized DJI resellers. 2.For how long will my DJI Terra license be effective? 3.What do I need to start using DJI Terra? 4.How many computers can be bound to the same account? 5.What are the computer system requirements for 2D and 3D reconstruction with DJI Terra? 6.Which aircraft are supported by DJI Terra? 7.Can I still use the paid features of DJI Terra with no internet connection? 1.What is the difference between Waypoints Mission, Mapping Mission, and Oblique Mission? 2.Why are there 5 flight routes when I plan an Oblique Mission in DJI Terra? 3.How do I plan flight routes when there is no internet connection and the map cannot be loaded? 4.What is Ground Sample Distance (GSD)? 5.In the New Mapping Mission page, what does Relative Height in Advanced Settings mean? How is it different from Mission Altitude in Basic Settings? 6.When do I have to adjust the Relative Height in Advanced Settings? When there is a large difference between the elevation of the takeoff location and the elevation of the area being mapped, you can adjust the Relative Height in Advanced Settings to ensure that the Mission Altitude is determined considering the elevation of the area being mapped. Please see the attached illustration: If the drone takes off from a 50m building marked H1 in the illustration, the area being mapped is marked A, and the expected altitude for aerial data collection is 100m, you can set the Mission Altitude in Basic Settings to 100m, and Relative Height in Advanced Settings to 50m. Similarly, if the drone takes off from H2 to map area B, which is a hill with an elevation of 40m, and the expected altitude for aerial data collection is 60m, then set Mission Altitude to be 60m, and Relative Height to be -40m. 7.What should I do to ensure accuracy in my missions when collecting data with the Phantom 4 RTK? 1)	Conduct your missions in clear weather conditions with high visibility. 2)	Check the images and videos for brightness and clarity immediately after your mission. 3)	During a surveying mission, avoid areas with strong electromagnetic interference or obstructions to ensure the accuracy of the attitude algorithm of the Phantom 4 RTK. Also make sure that the remote controller is properly linked to the aircraft. 4)	Ensure there is enough forward and side overlap. It is recommended to have a forward overlap rate of 80% and a side overlap rate of 70%. Overlap rates can be adjusted depending on the terrain. 8.When should I adjust the overlap rates based on the terrain? 9.When I connect DJI Terra to Phantom 4 RTK, the app tells me that I cannot take off because the RTK signal is too weak. What should I do? 10.Does DJI Terra support the marking of Ground Control Points (GCPs)? 1.Why is my computer stuck when processing images locally to reconstruct a model? Can I run DJI Terra while running other programs? 2.What are the Field, Urban, and Fruit Tree Scenarios in 2D Map? 3.What projection is used to obtain the 2D mapping results in DJI Terra? 4.Why is there a large discrepancy between the elevation result in the digital surface model (DSM) of the 2D map generated by DJI Terra and the actual elevation measured via RTK? 5.What is the difference between 3D Reconstruction in Mapping Mission and in Oblique Photography Mission? 6.How different are the 3D models built at different resolutions? How long does it take to build models at these resolutions? 7.Why are there gaps in my model? What are some factors that affect the quality of the reconstruction? 8.Can I trim or edit the 3D models generated in DJI Terra? 9.What files can I get from the 2D maps and 3D models built in DJI Terra? 10.How do I view the results and files from my 2D maps and 3D models? 11.What variables might affect the accuracy of the 2D and 3D reconstructions in DJI Terra? 12.What is the accuracy when building 2D maps and 3D models with the Phantom 4 RTK? 13.Which coordinate system and elevation are used for 2D and 3D reconstructions in DJI Terra? 14.Can I run multiple missions on the same computer? 1.Can I modify the location where my 2D and 3D reconstructions are saved? Yes. The default path is C:\Users\***(User Name)\Documents\DJI\DJI Terra. You can modify the path by going to >> >> Cache directory. 2.Can I import models generated in DJI Terra into other software programs, such as Maya, Blender, SketchUp, and 3ds Max? 3.Can I embed a 3D model into a webpage? 4.Can I use non-aerial images to build 2D or 3D models? 5.Can I process images taken from non-DJI drones in DJI Terra to build 2D and 3D reconstructions?